If this watch looks for familiar, it’s for good reason. 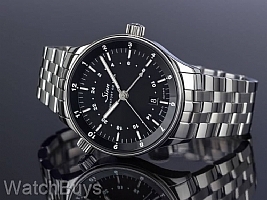 The Sinn 6060 Frankfurt World Time has been a best seller in the line for many years by offering the unique ability to show three separate time zones simultaneously. This new model, the Sinn 6096 Frankfurt World Time, maintains all the great features and the Sinn 6060 but moves the date window to six and expands the case size from 38.5 mm to 41.5 mm. With three time zones on a 12 and 24 hour basis, the Sinn 6096 is the perfect watch for professionals on the go. Historically, watches in the Frankfurt Financial District series have been smaller in diameter, but the Sinn 6096 sports a 41.5 mm case. It is also remarkably thin, with a case of thickness of just 12.1 mm, which makes it very comfortable to wear in combination with shirt and jacket sleeves that can often get caught on thicker watches. This watch features a three time zone display. The second time zone is read through a separate GMT hour hand operating on a 24 hour scale, while the third 12 hour time zone is read from the ratcheting inner ring set by the crown at 10. You would think a watch displaying three times zones would be cluttered and difficult to read. 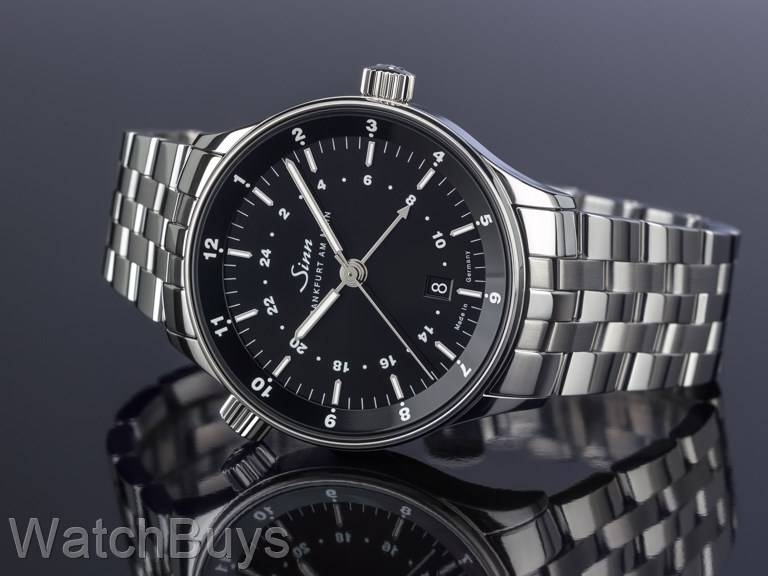 Sinn however has managed to design a watch that is remarkably clean and legible. Other features include Sinn's D3 crown system which permits the crown and push-piece to be integrated in the case, providing reliable protection from lateral knocks and the penetration of dust or moisture. The black dial is electroplated with a sunburst decoration, and the hour and minute hands as well as the applied indices are coated with SuperLuminova. The case is in 316L stainless steel, and is polished. Sapphire glass is used on both sides to display the highly decorated movement. 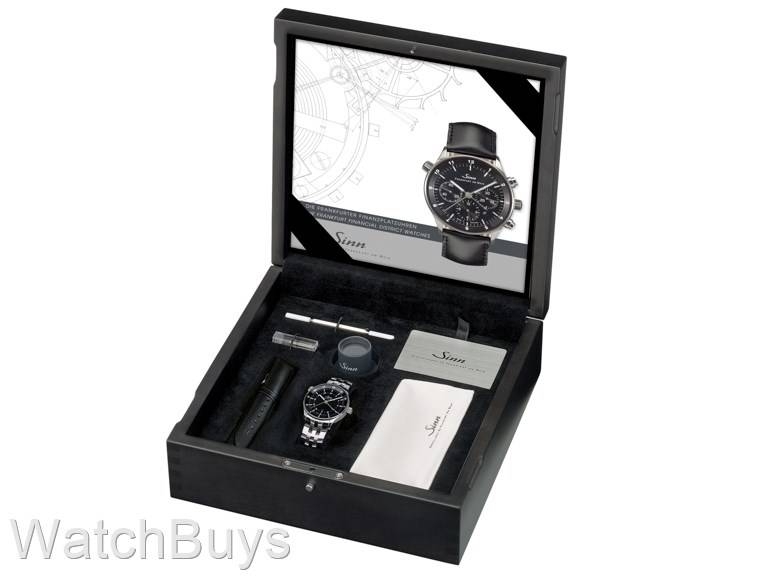 When purchasing a Sinn 6096 you not only receive an outstanding timepiece, but a number of extras that are included with all Sinn Frankfurt Finance Series watches. 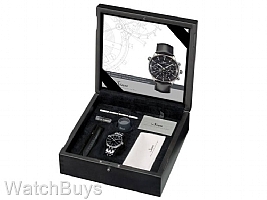 The watch is presented in an elaborate case with a fine link bracelet, black Sinn cowhide strap with signed Sinn tang buckle, band replacement tool, additional spring bars, watchmaker's loupe and a Sinn cleaning and polishing cloth. We will begin receiving this watch in small batches in January, 2018. If you would like to be among the first to own this watch, please click the Notify Me button at the top of this page and complete the form. We will notify those who have completed this form once watches begin to arrive in our offices.